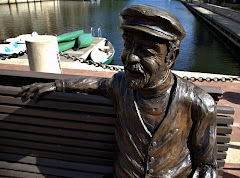 Restonian: News blog from Reston, Virginia, the mauve-colored New Town (tm): Radioactive Reston: What Could Possibly Go Wrong? 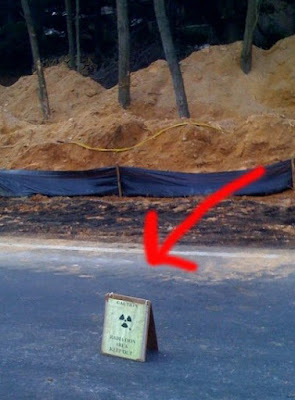 Radioactive Reston: What Could Possibly Go Wrong? This highly conspicuous warning sign was posted on the side of Baron Cameron Avenue near yet another random tree-removal project, this one adjoining Northgate. In case you couldn't read the 12-point lettering on the six-inch-high sign while driving by at 55 mph, the sign reads "RADIOACTIVE AREA: KEEP OUT." So don't blame us if you start glowing after taking a right turn onto Wiehle Avenue. Maybe that's why the last time I saw Bob Simon, he looked like this.